This article is 3092 days old. For some Windsorites, cozying up to the bar to watch the game is all the culture you need. On the other hand, some Windsorites feel a distinct lack of culture in our city. By distinct, I mean specific. And today, I’m talking about opera. They’ve chosen to depict Mozart’s Der Schauspieldirektor (or The Impresario for those with no German), a short singspeil (in English, that’s song-play) that debuted in 1786 when Mozart entered a competition sponsored by Holy Roman Emperor Joseph II in Vienna. The premise is a simple one, and it’s sure to be entertaining. Two divas are vying for the same leading role in an upcoming performance, and during rehearsal they do their best to convince the director that theirs is the stronger voice. Local songstresses Christina Bell and Jackie Robitaille will play the role of the adament divas, while Rob Jubenville will take on the part of Mr. Cash, the director. Accompanying will be Benjamin Lesperance, and the score arrangement/assistant director is Erik Ingalls. 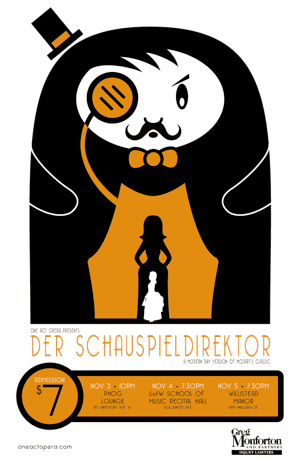 The crew will perform Der Schauspieldirektor three times this week; the first will take place tomorrow at the Phog Lounge (10pm), Thursday you can see the show at the university’s School of Music Recital Hall (7:30pm) and Friday the show will go on at Willistead Manor (6:30pm). Tickets are just $7, and can be purchased at Priced Green, the Phog Lounge, or at UWindsor’s School of Music box office. This is what’s great about Windsor. It’s ok to be that guy, the one that enjoys slurping tall boys and yelling at the TV hanging over the bar when a fumble mucks up the down. But it’s the brave new endeavors, like One Act Opera, that make living in this city even more exciting.